My favorite (and only) brother-in-law began seriously dating a lady I also liked a lot. They were a great couple and after a while, moved in together. We visited from time to time and really enjoyed them. 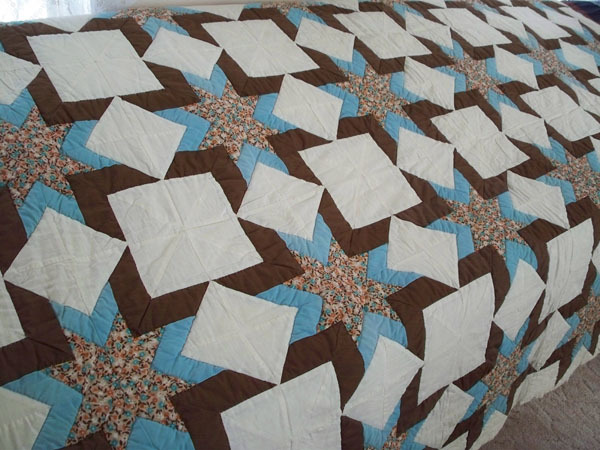 The subject of quilting came up one day and Penny asked if I would make a quilt for her and Paul. Together, we chose a pattern I was willing to make and they chose the colors they preferred. We all agreed on a price so I purchased fabric and began the quilt. As I was machine piecing the top, they’re relationship continued to become more and more serious so I intended to present the quilt to them at their upcoming wedding. They each had discussed their impending marriage with me so I thought the quilt would be a perfect surprise gift. They broke up and because Paul was emotionally and financially devastated, he moved in with us for a while. I put the quilt away until he got back on his feet and moved into his own place. I finished the top, then hand quilted it. It has wide muslin backing and lofty batting. It was hand quilted in the ditch. Paul remains my favorite brother-in-law, though I seldom see him since he moved to Florida. 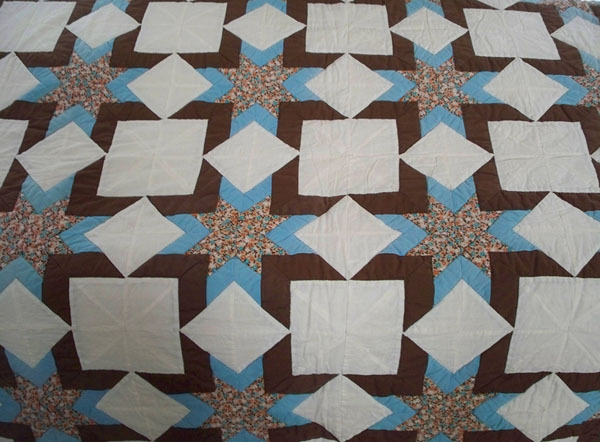 I eventually sent the quilt to him in thanks for our close friendship. These are the only pictures I have of the full-size quilt.